I’m back today with more Christmas in July projects this week. I know you’re thinking, it’s way too early for Christmas cards and crafts, but it’s not. The Back To School sales are in full force and local craft stores have been bringing in the pumpkins. And, the Stampin Up Holiday Catalog will be coming very soon and we’ll have some brand new goodies. In the meantime, I’m sharing some products that are in the Annual Catalog & Idea Book. Today’s card uses the Reason For The Season stamp set. The main focal stamps in this set are the poinsettias. However, for this card I used just the leaf stamp and the sentiment. I did hand cut out the leaves so they look more like branches. Then I used my fine-tip glue pen to adhere them to the tag making sure to overlap the ends. The White Perfect Accents only come in white of course. This is so you don’t have to buy packs in every color that you need. You can color just what you need for a project. I used my old Cherry Cobbler Blendabilities marker to color them to look like berries. I know that the Blendabilities are a sore subject because there were so many product issues with them. I was able to get them before they were discontinued and I do still use them. If you don’t have Blendabilities, you can use another brand of alcohol markers to color the Accents. The gold satin ribbon is tied around the tag and in a bow. I struggle with getting my bows to lay nicely. I will admit, I’m not above using my glue dots to hold my bows in place. Use this tip anytime you’re ready to give up on bows entirely. 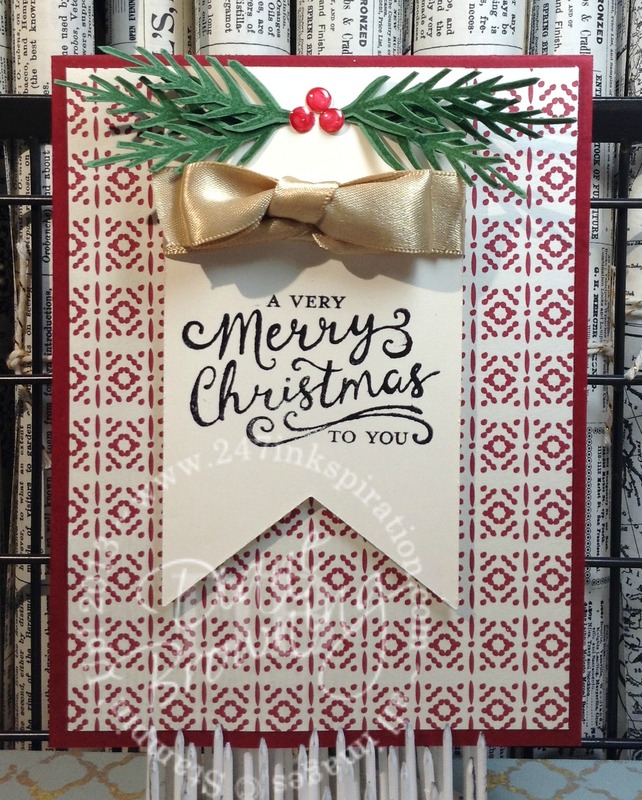 Starting tomorrow, Stampin Up is sharing sneak peaks of the upcoming Holiday Catalog with Demonstrators. If you were a Demonstrator, you would have access to these videos. And, you would be able to get your Holiday products early starting next week. The Holiday Catalog is live to customers (non-Demonstrators) starting in September. That’s a whole month after Demonstrators get their goodies. You really should sign up to be a Demonstrator so you can take advantage of opportunities like this. If you have any questions about being a Demonstrator, I would love to answer them.